The SIGMA Clad 5-ply material guarantees fast and absolutely even heat distribution right to the very edge of your pots and pans. The stainless steel surface of the pots and pans is coated with Silvinox: This electrochemical treatment creates the typical silvery glossy finish on the surface. 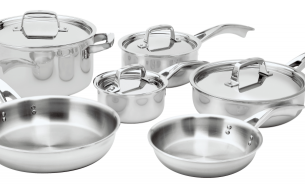 And while conventional steel darkens with time, after many years of use Silvinox cookware is still as shiny bright and new as it was on the first day. Manufactured to meet the rigorous demands of culinary experts. The robust clad construction bonds 3 individual materials together to create a vessel of exceptional cooking performance: the interior is 18/10 stainless steel for optimal resistance to stains with no taste transfer, a core of pure aluminum ensures quick and even heat distribution to ensure balanced cooking without fear of hot-spots and the outside is a magnetic chromium steel enabling superb performance with the latest induction cook-tops. The sculpted hollow-cast handle with a “V-shaped” riveted connection stays cool for enhanced safety and less elbow strain. 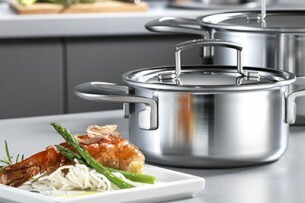 This brilliant mirror finished cookware series is oven safe up to 260°C / 500°F.